Many of us still have healthy old PCs and laptops. Being "old" means 32-bit, so if you want to run GNU/Linux there you need 32-bit version of GNU/Linux. The problem we're facing is we find many distros have removed their 32-bit versions. This means we need to find distros which are still supporting 32-bit. And this article provides you a compilation of those. You will find here Flavors of Ubuntu, Fedora Spins, Debian Live, and more and more are keeping 32-bit versions. You can choose one among them to empower your old computer with latest version of free software with long duration of support. I mentioned here information such as latest release, support lifespan, editions as well as what distros which are not supporting 32-bit anymore so you can compare and decide which one suitable the most for you. Go ahead, happy downloading, happy working! Of course, I don't mention here non-desktop distros such as Arch-family and Dragora-like. You can make Arch a desktop distro indeed, but it needs installation and special configuration further so this example does not count as desktop distro. Since 17.04 (2017). This means 17.04 onwards are 64-bit only. Since 18.10 (2018). This means 18.04 LTS and 16.04 LTS are still supporting 32-bit. Important: latest Fedora original also keeping 32-bit support! Fedora Spins are similar to "Ubuntu Flavors" or "Debian Live" on their respective terms: they are desktop environment based variants which are LiveCD. All Fedora Spins come preinstalled with Firefox and LibreOffice. Important: Debian regular (non-live) is also keeping support for 32-bit. Do you know that Debian also has Live editions? You can think Debian Live similar to Ubuntu Flavors and Mint Editions, as it provides all desktop environments available on those both distros. Important: Ubuntu original up to 16.04 LTS still supports 32-bit. Distinguishing Ubuntu "original" with "Flavors" is important. The original indeed doesn't provide 32-bit anymore, that's true. But the Flavors still provide that, namely Kubuntu, Xubuntu, Lubuntu, Ubuntu MATE, Ubuntu Budgie, and Ubuntu Studio. All flavors come preinstalled with Firefox and LibreOffice. See download links compilation for 18.04 and 18.10. 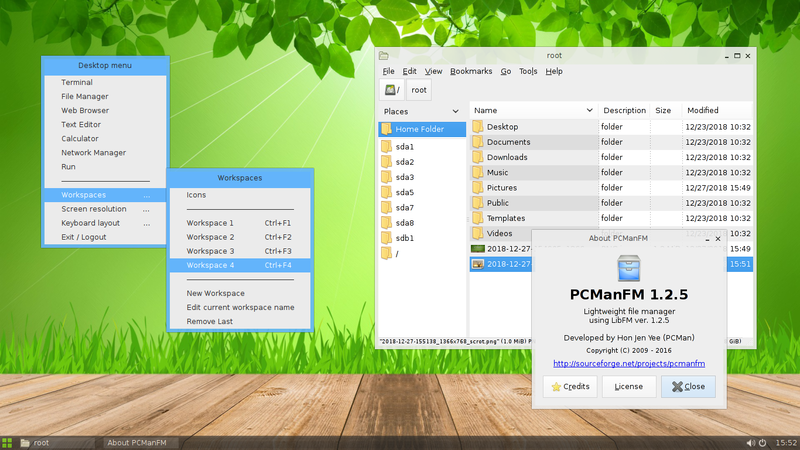 The favorite of many, Mint is a long-standing desktop oriented distro derived from Ubuntu. Mint existed before Manjaro, has been already popular before Mageia, had ever been ranked #1 on Distrowatch (up to now it's still among the top 5), and often recommended by people around us if we want first experience to GNU/Linux. If you think Ubuntu is user-friendly, Mint is considerably more friendly, crafted solely for desktop and even the team developed its own desktop environment, Cinnamon. All editions of Mint has user interface that resembles Microsoft Windows making them very suitable for you switching from that proprietary operating system. It comes preinstalled with Firefox and LibreOffice. Mint is an incredibly active community both in their blog and in their forum. Personally my favorite one, Trisquel is a complete desktop OS and a 100% free software one. If you would love to choose one among 8 of them today, for beginner, I believe you'd choose Trisquel instead. It uses Linux-libre kernel instead of Linux vanilla one. Comes preinstalled with Abrowser and LibreOffice. Sparky is a Debian-based GNU/Linux distro which is both fixed and rolling release. I would love to say personally MX is Mepis antiX as it's a join force between those two communities. MX offers a lightweight distro with XFCE desktop by default. You can consider Krypton as a replacement to Manjaro in rolling basis as it keep 32-bit support while Manjaro abandoned it. Krypton is based on openSUSE rolling release named Tumbleweed. It's the advantage of it over Argon which only supports 64-bit. Krypton uses zypper package manager and the great YaST as its control panel. Repository for Krypton is the one original from openSUSE plus special KDE repositories. That's SLAX official motto. It was originally a Slackware derivative, but is now based on Debian instead. It's a hobby project by Tomas Matejicek. SLAX is a small, portable, USB-stick desktop operating system which you can run on one computer to another one without installation. It's only 200MB in size. It includes Chromium web browser, PCManFM, XTerm, and more by default. Its package manager is apt. If you're able to run Ubuntu then you will be able to run SLAX this way. However, it does not have any bug tracker nor public coding place nor wiki, but its blog is very lovely with a lot of users' comments. Salix is a Slackware-based lightweight XFCE distro. It's fully compatible with Slackware so Salix users can use Slackware packages and vice versa. Salix is compatible to Slackbuilds and AlienBOB repositories. Salix features slapt-get as its package manager by default (not slackpkg, nor pkgtool). It provides both InstallOnly and LiveDVD versions. Just like Slackware, Salix does not use systemd. Porteus is a Slackware-based multiple-desktop lightweight distro that is portable. It's designed to be run from a USB stick with persistent capability by default. From a pure user point of view, seeing Porteus is similar to seeing Debian Live, regarding its desktop environment editions. More than that, a distinct feature compared to SLAX and Salix is that Porteus has KIOSK Edition. That's all. I hope you will be satisfied with my list. Actually, at the moment I'm writing, I found out more distros to be keeping 32-bit support such as heads (a free-only fork of Tails) and Q4OS. Beside those, there are Calculate and Pentoo (both are Gentoo derivatives). I believe there are still many options available out there. But I don't compile those here as I want a simpler list (honestly, I also don't have enough time for more). I am really glad I can mention one libre distro here (Trisquel) and also I find such distro like SLAX which is technically amazing. How can a 270MB distro gives a beautiful translucent desktop with Chromium browser, PCManFM, Debian repository, and full networking capability? You'll soon feel what I felt if you tried it. Try them, revive your old computers, and find your favorite one. I hope this compilation helps you a lot and helps reduce computer waste around the world. Happy working, happy reviving!